… As the curtain rises, we see little Johnnie all dressed in his new hat, red coat and black boots. He is standing next to the reading chair. “I want to go outside and play,” he called to his mother. It was early morning, even his cat Goldie was still asleep. Through the big window behind him he could see the garden with the cone flowers and the white picket fence. He wondered when his Mother would let him go beyond the white fence? He had a sandbox near the stone dove and a hiding place near the fountain. He loved to go through the red door into the garden. But he also longed to go over the white fence across the grass and beyond the meadow. He imagined exploring the forest. He heard there were creatures living in there. Perhaps he would see Winnie the Poo, Brer Rabbit, Mowgli or Mole and Ratty. He was sure the Hundred Acre Woods, the Riverbank, and the Jungle were in there among those far off trees. He wanted to check it all out for himself. He knew for sure that true adventures happened out there because his mother read to him from the night-time storybooks. I love the creative process. 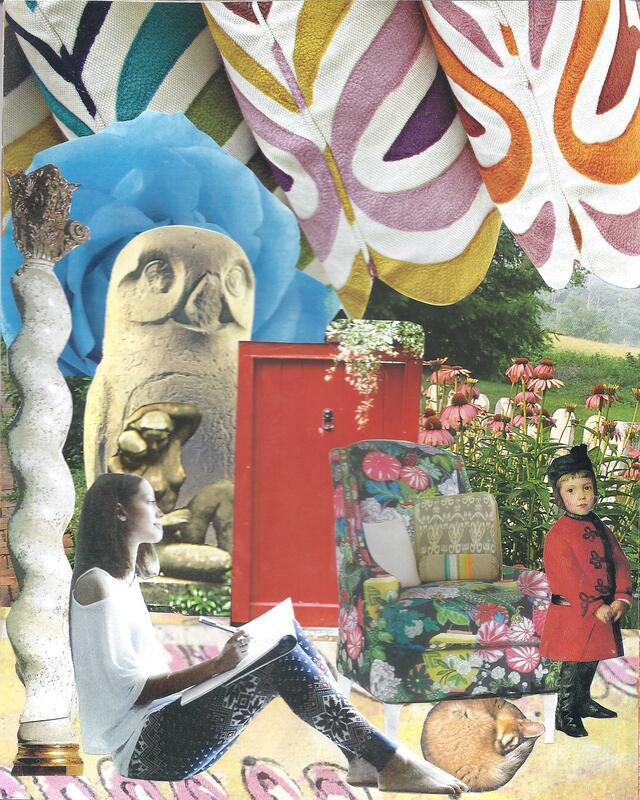 When I look at the finished Collage new stories and possibilities show themselves. The images prompt a tale of my own creation. Part of the fun of our image exchange is opening the mail and looking through the items enclosed. Right away I fell in love with the child in the Red Coat. I also loved the Blue Rose. Which can be seen in the collage behind the stone bird. I eliminated a couple images but there were two other images I tried to include but even after altering there size and tucking them in here and there I couldn’t get them to work in this composition. What’s it all mean? What do I see in the combination of images that have spoken to me? I love the red door. It is unpretentious, strong but not threatening. I love the view of the flowers, their color, their form. I enjoy considering the white picket fence, the large evergreen tree and the mist on the meadow leading to the forest off in the distance. The chair, its style is formal but the fabric is delightful and reflects the petals on the garden flowers .I had the image of a pile of contemporary pillows for a while. I wanted to use the image but not as pillows. I like the pattern. I turned the pile on its side along the bottom third of the compositional frame but they migrated up to the top. They have a mask like quality to the design pattern, as if they represent a chorus watching the story or theater curtains lifted to expose the stage play. The scene has a safeness, a warmth about it. Is the young woman the child’s mother, his nursemaid, babysitter, a relative or an older sister? I also love the young woman’s gaze. She is lovingly focused on the child. The child is a wonderful, precious, innocent. How lucky women are to “know” the wonder of the new innocent. The cat, curled up under the chair reminds me of my cat, able to sleep anywhere. I find the pillar she is leaning against with its curves very feminine and sensual. The stone bird, missing its beak, makes it hard to tell if it is an owl or dove, both familiars of the Goddess. The blue petals of the rose form a halo behind the bird’s head. A Rose is also very special to the Goddess. This piece reminds me of innocence, safety, love, protection and the playfulness of our imagination.